In Greek mythology, this is the fabled ship in which the Argonauts, under the command of Jason, ventured out to reclaim the golden fleece, a treasure that had been lost. To do this, these hearty adventurers suffered toils and dangers, battling hideous forces of evil with superhuman ability. Jason (which is the Greco-Roman equivalent to “Jes us”) is seen as going out to retrieve that precious thing that was once the rightful possession of a loving owner. Here the ancient corruption of the most beautiful story every told is plain to see — it was, in fact, Jesus who went out from glory to redeem His beloved! This sign is the largest of all the constellations, stretching in the original design from a region south of Orion to a region south of Corvus, fully one-half of the southern sky. 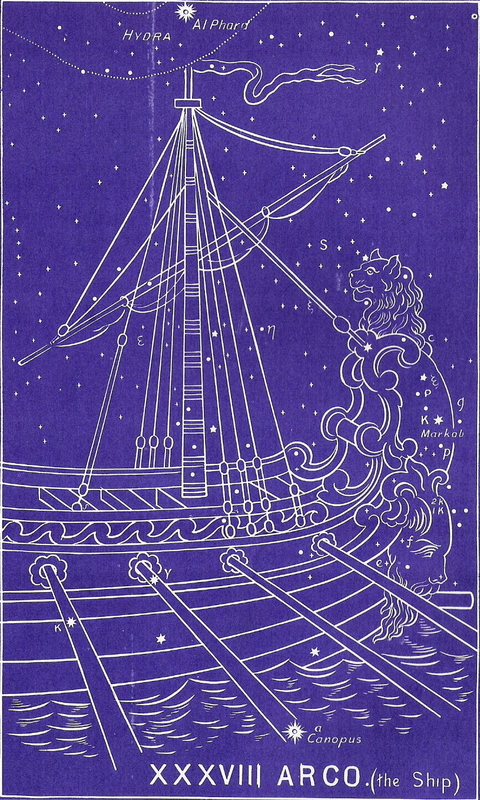 In fact, it was subdivided into three separate constellations — Vella (sails), Carina (keel), and Pupis (poop deck). It actually contains two galaxies! We come now to the end of the chapter of conflict for the millennial reign of Jesus Christ. (See Cancer and its other two decans for more info.) We have already seen several areas of conflict that can arise during this time period — but there is still one area that we haven’t touched on much — the deeply rooted spiritual needs of mankind. This is seen in Argo. We see a ship entering the harbor, safely completing its journey. From the star names, we know that all aboard have traveled in security. And we see the final and most desperate need of man met in this picture in the sky because it is to those who are WITHIN this ship that the gifts of peace and security are given, freely and happily by the Lord. What is this most desperate need of mankind? It is that “God-shaped vacuum” of which Paschal wrote, that inner “emptiness within our soul” that cannot be filled with anything that man or his institutions can fill. It is the need for a personal, vital relationship with our Creator. Try as he might, a man can only add frustration to the emptiness if he attempts to fill that vacancy with anything else. Only a personal relationship with God through His Son Jesus Christ can fill the void. And this is the picture here. The ship is also representative of another millennial truth — the New Jerusalem pilgrimage. We read in Scripture that the citizens of the millennial kingdom will greatly desire to “ascend up to the holy hill” and there see King Jesus. This pilgrimage might very well be at the center of the lifelong plans of these millennial kingdom citizens. This is the blessed assurance of the Gospel message — that all that the Father has given to Him, Jesus will not lose even one! Even when the 99 are safely enfolded in His loving protection, He will still do all that is required to seek and save the 1 that is lost. Therefore, this “ark of safety” is of such vast proportions — big enough for all who would come to the cross of Calvary and there receive the grace of God. At the cross, and in the ark, there is room enough! Pay careful attention to the meaning of the names of the stars. They will ALWAYS back up the message above. To continue in the correct order of the ancient star chart, please select Leo next. Or click on The Big Picture to learn more about this Gospel in the stars.